Halfway through the film I said to Mutsumi about a scene that struck me as particularly well-composed, this looks like a painting. Most of the film, she said, looks like a painting. And she's right. It does. 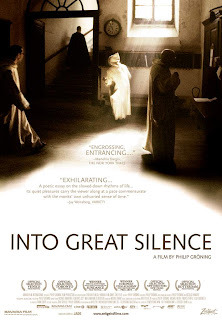 Into Great Silence is perhaps one of the most beautiful movies of recent years, a cinematic poem of tranquility and serenity that may leave you wishing you didn't have to return to your hurried life in a noisy, cluttered world. German director Philip Gröning lived for six months with the Carthusian monks of the Grand Charteuse, a 17th century monastery in the picturesque quietude of the French Alps. With no crew and shooting only in natural light, he followed the renunciates on their daily rounds, capturing the languid flow of days filled with prayer, study, and labor. What he produced in the editing process is described in his publicity material as a document “seek[ing] to embody a monastery, rather than simply depict[ing] one.” That is, Gröning offers the viewer the opportunity to experience the life of the monastic, rather than be told about it. There is no narration, no explanatory subtitling, no score, and except for the passing of days and the passing of seasons essentially no narrative. What you might find while viewing is exactly what you experience when you live quietly in sheltered environments. You begin to notice detail. Small details that your mind usually flirts over in a rush to complete a task or in search of more gross forms of stimulation. Close shots of a masticating jaw, a piece of fruit, a length of hanging cloth, or a wash basin suggest Gröning experienced the same. When you take away the cacophony of telephones, television, cinema, radio, and the internet, when you take away the need to live by the clock, to keep appointment books, to always be in a rush, your senses have a chance to rest, to experience the rhythm and pulse of the body. And then you find the most mundane things intriguingly beautiful – the grain in a piece of wood, the dance of dust motes in a sun beam, the play of water over rocks, trees swaying in the breeze. Quite suddenly, the world is full of wonder. Is it any surprise, then, that though they lead what most would consider lives of deprivation, the monks of the Grand Charteuse appear to be men whose lives are filled with great happiness. Just drop by to say hi -). I m pretty sure you do not know who I am-A girl you have met in 1st day of 2009 at the guest house along the Ganges . Well, I do remember you well, I drop by to your blog once a while( well quite a while) , to check out your blog and just found out you have left Nepal and back to Japan, and seems is soon going away again to somewhere else ! good on you !. well, just want to wish you well and take care. Of course, (after following your profile link back to your blogs) I remember you! Yes, it looks like I may be moving on. I look forward to seeing you again in Saudi. Are you in Cambodia now? too bad my blogs are mainly in Mandarin, or else you can read about my 'love-hate' feeling towards india too -). Yes, i would definitely hope 1 day i'll see you again! somewhere, some place.. You are such an inspirational figure to me- someone always moving, always learning ..I been to Combodia 3 years ago, Angkor Wat, magnificient. Now, sadly i m in concrete jungle of Singapore...if you do come here 1 day, drop me a mail, I'll bring you and yr wife to some local food -). Take care in Saudi!